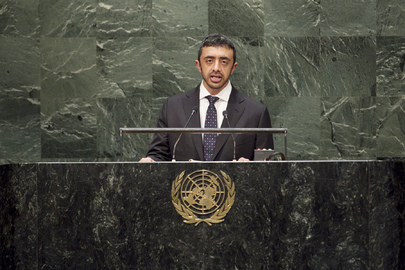 SHEIKH ABDULLAH BIN ZAYED AL NAHYAN, Minister for Foreign Affairs of the United Arab Emirates, denounced terrorist organizations and their commission of brutal, criminal acts in the name of Islam. Islam rejected such crimes as inconsistent with its moderate approach and principled position on the peaceful coexistence of all peoples. The increased incidence of terrorism and extremism in the region, especially that perpetrated by the Islamic State in Iraq and the Sham (ISIS), posed threats beyond borders. The current collective action to confront the threat of ISIS and other terrorist groups reflected the common conviction that the imminent danger must be addressed. In short, civilized communities must succeed in eliminating the threat. He also expressed concern at the deteriorating security conditions in Libya and their repercussions on the stability of neighbouring countries, and noted with alarm ISIS's exploitation of the sectarian practices of the former Iraqi Government; it was threatening Iraq’s sovereignty and exploiting the chaos in Syria to achieve its purposes, without regard for sovereignty or national borders. He called on the international community to take comprehensive measures to fight terrorist groups through a clear, unified strategy, including in all locations, wherever they existed. Support for Governments facing security challenges was also of critical importance. His country was building capacities and exchanging best practices on the issue, and was developing national policies to deter and eradicate the roots of terrorism. The lack of tangible outcomes from negotiations between Palestine and Israel was disappointing, he said, condemning Israel's aggression. He rejected the continued occupation of three of his country's islands by Iran, calling on the international community to urge that country to respond to his calls for a just settlement. At the same time, he welcomed the ongoing negotiations to find a comprehensive settlement of Iran's nuclear programme, while also noting the important role of nuclear energy in meeting the world's energy demands. The United Arab Emirates was a successful model of the use of nuclear energy in a way that was transparent, safe and secure. On the post-2015 development agenda, he supported sustainable energy for all, and, among other things, gender equality and women's empowerment. His country's achievements in the latter area gave it a prominent place among nations. He also urged all parties to abide by climate change agreements, with developed countries taking the lead.